Elffi is a male cosplayer from Finland. 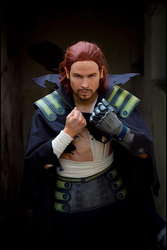 He got interested in Japanese language, anime and manga in 2004 and made his first cosplay at summer 2006. He was representing Finland in World Cosplay Summit (WCS) in Nagoya, Japan, in 2011 and has also won numerous other awards and nominations worldwide. Elffi has been a visiting judge, panelist and guest in over 11 countries on 3 continents. In real life he is studying Japanology and Asian Business and works occasionally as a taxi driver. Coffee, beer and gym are close to his heart. He tends to say that without cosplay as a hobby he would not be in shape at all. Known as a very outgoing person he loves to travel, see new places and meet cosplayers all over the world!